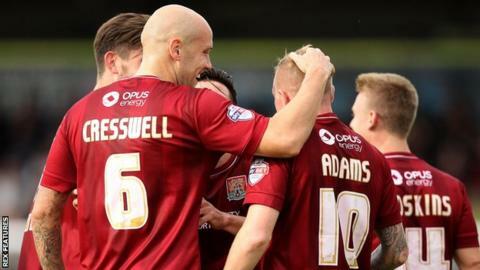 Northampton Town's prospective takeover by an unnamed Indian consortium is off, after the group pulled out of the deal. Chairman David Cardoza revealed the group's interest in June but has now "moved on to talk to other parties". The consortium said in a statement on Monday: "It became apparent there were a number of complications surrounding the proposed acquisition." The original loan from the council was given to the club for the re-development of Sixfields, and was to be used to build the new East Stand, along with a hotel and conference centre - none of which have been completed. A Northampton Borough Council spokesperson said of the news the consortium had pulled out: "The deadline by which we have required the club to pay back the loan falls later this week and when it does, we will then consider our next steps. "We remain open to talking to the football club and any new buyers who may come forward at this late stage." Meanwhile, Cardoza said in response to the consortium's statement: "I'm not surprised by the announcement, my only surprise is the timing of it. "The Indian consortium had a few months to move things forward and conclude things but it became apparent they were not progressing matters. "There are a number of other interested parties and as it became more and more apparent things were not proceeding with the Indian consortium, then we began talking with these other parties. "We have made significant progress in these talks to a position where things are now well advanced." The London-based consortium hoped to buy both the football club and land around their Sixfields home, and signed a heads of terms agreement in June to take the process to due diligence, where it says these complications were found. The group's statement continued: "Sadly, at a very late stage in the process we concluded that these problems were insurmountable and, with great reluctance, decided we had no option but to withdraw our offer for the club. "This has never been a vanity project for the consortium, which is why we have not previously publicised our involvement; we are serious investors who believed Northampton was the ideal location for a thriving football club." "This news will come as an unwelcome distraction to manager Chris Wilder and his players, while it is worrying for the club itself and the supporters. "On 12 September, Cobblers fans organised 'We Want Answers' - a campaign against what they perceived as a lack of communication from chairman David Cardoza. "Since then, on the pitch the players have rallied with 14 points from 18 in League Two, but nothing has changed off it. "The fact news of the takeover collapse came via a press release from the the unnamed London-based Indian consortium, with nothing from Northampton Town, may show what the fans have been complaining about."